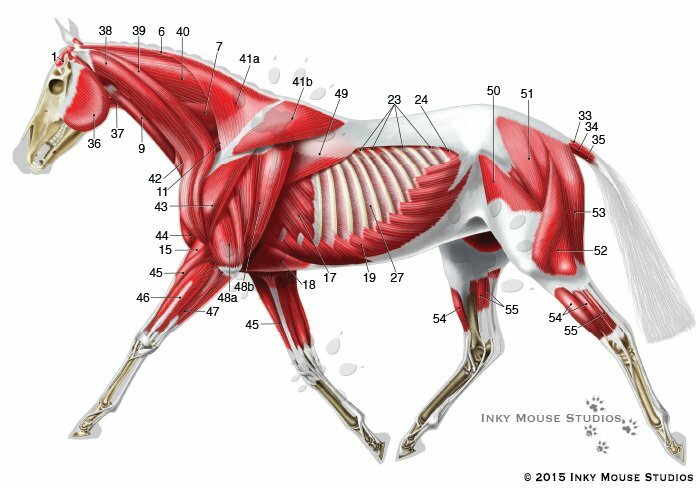 This custom veterinary anatomical illustration of the equine superficial musculature features a lateral view of a horse in motion rather than the usual standing pose, since the client it was created for works with performance horses. This image includes the superficial musculature of the horse, as well as the skeleton, ligaments and tendons which are associated with it. There are two other illustrations which are associated with this illustration, one of the deep musculature of the horse, and another of the skeletal system of the horse.